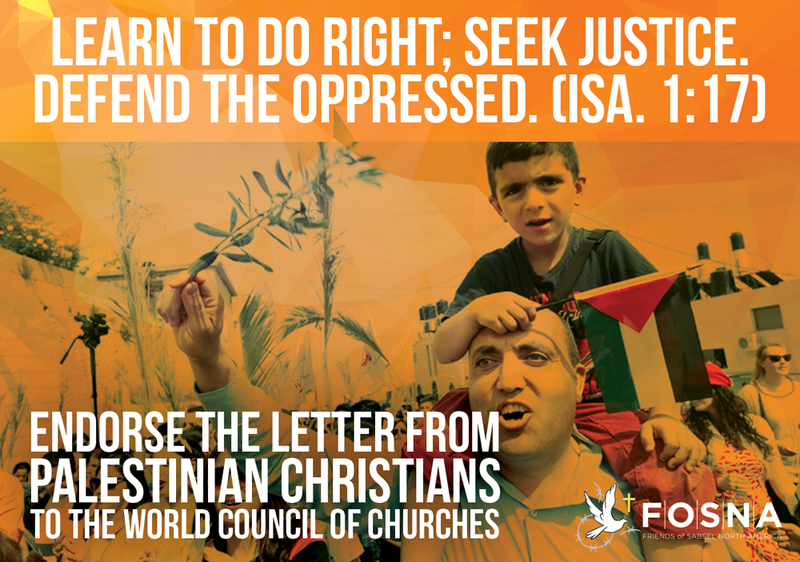 We, Christians throughout the United States, stand with the Palestinian Christian community and urge the World Council of Churches (WCC) to adopt their call to take brave action in the face of 50 years of Israel’s military occupation, 70 years since the Nakba and ethnic cleansing of Palestine began, and 100 years since the Balfour Declaration. As the WCC gathers in Bethlehem on the 10th Anniversary of the Amman Call may you adopt the actions outlined in the NCCOP's prophetic letter. As Christian clergy and lay leaders in the United States, we commit to redouble our efforts to amplify the voices of Palestinian Christians and mobilize our communities to act as outlined, from recognizing Israel's human rights violations, to defending and intensifying economic measures used to pressure Israel to recognize Palestinian human rights. Together may we find the strength to face the pressure, speak the truth and heed the call. Christian clergy, lay leaders, Organizational Representatives, and other allies: Add your support!